A pleasure craft does a little whale watching as they view a family of Orca off Vancouver Island in British Columbia in Canada. 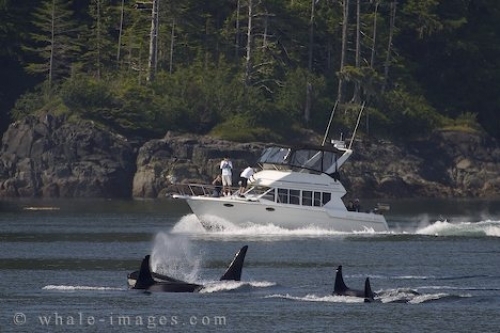 While on a whale watching tour off Northern Vancouver Island in British Columbia, Canada we get an excellent close up of this family of Northern Resident Killer Whales along with another pleasure craft enjoying the same pod. This family of Orca cruises near the shoreline as they head off in search of food or other fellow mates. Most of this family appears to be females as there is only one Orca with a tall dorsal fin which would be the male. The smaller killer whales may yet turn out to be males but it takes a few years before their dorsal fins sprout. To get a family of Orca swimming together is a beautiful sight as they surface and leave the mist from their blowholes lingering behind. Not only is this one of the most precious moments to capture on film but it also good for identification purposes to make sure that the family of Orca are all accounted for. The wilderness that surrounds the waters off Northern Vancouver Island, the calmness of the waters and to see an Orca family leisurely passing by on a whale watching trip is one of the most memorable moments of your adventure. To watch these incredible mammals in their natural environment is something that everyone should experience at least once in their lifetime.